I love honoring milestones and making time to weave the golden threads of celebration into life, so here’s another fun idea to add to my party planning series. 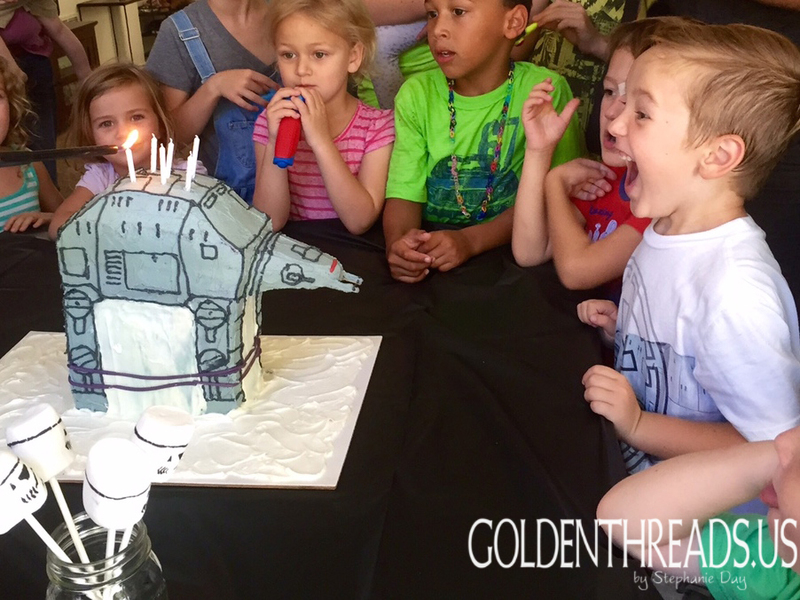 For most of us born in the mid-70’s, throwing our kids a Star Wars birthday party is almost as exciting as being at our own 30 years ago. My husband was (and still is) a big fan, but even I dressed up as Princess Leia for Halloween two years in a row. 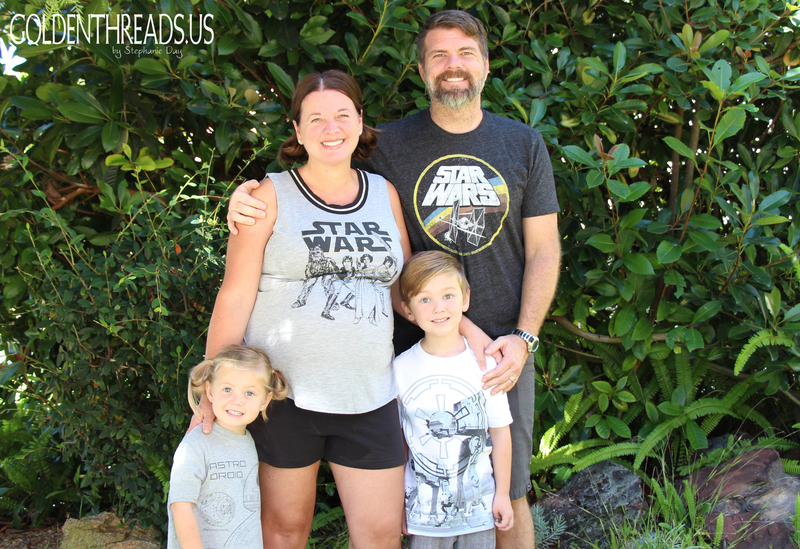 Go ahead George Lucas (ok..Disney) and resurrect a parent’s childhood stories and heroes and introduce them to their kids. New generations of Star Wars fans everywhere. Brilliant. 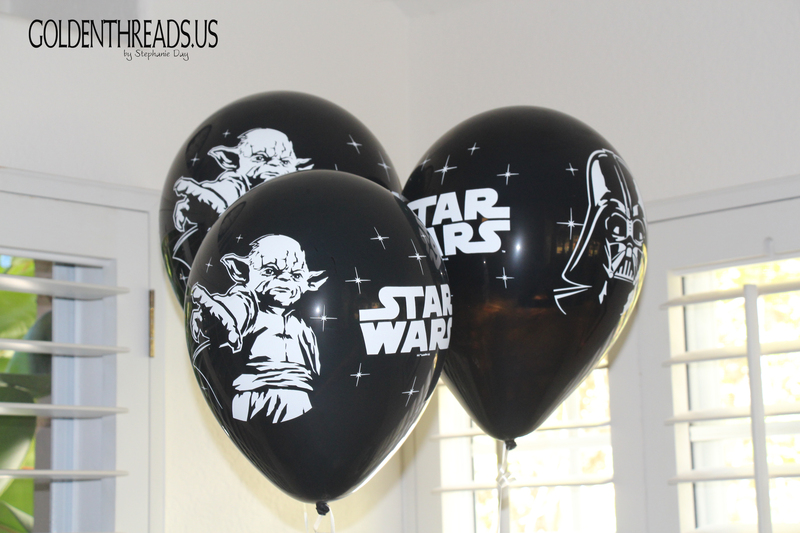 Last month our first-born son Sawyer turned 6 and since he is currently excited about all things Star Wars, we pulled together a really fun party for our little Jedi. 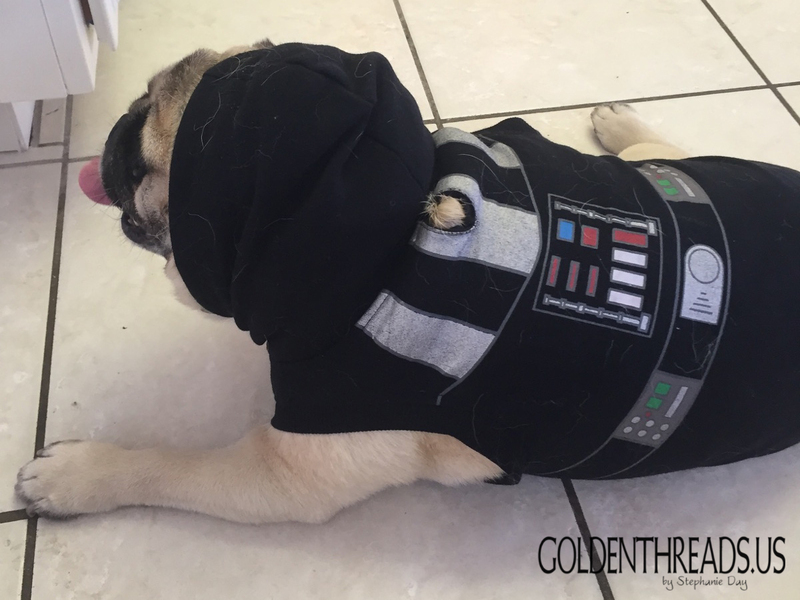 Even our Pug got decked out in his Vader hoodie. 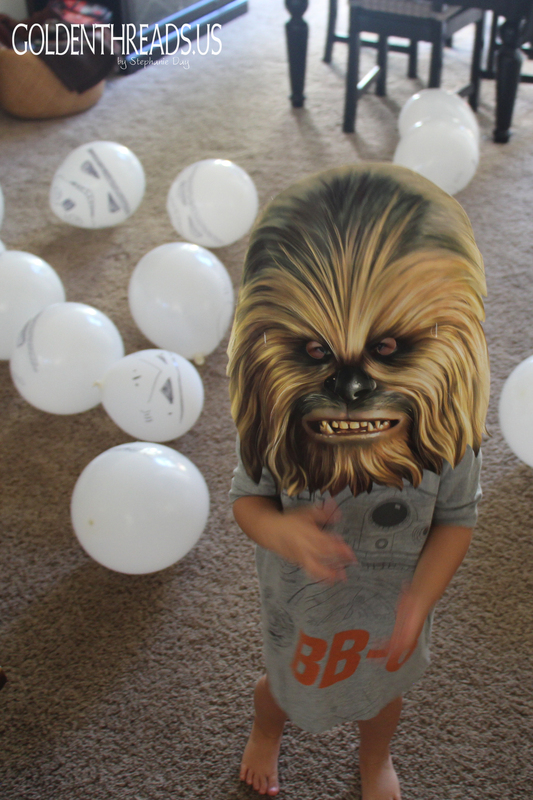 Conveniently we used our son’s toys for most of the party decorations. He has a big stash of his dad’s old Star Wars toys as well as ones he has collected over the past year or so. 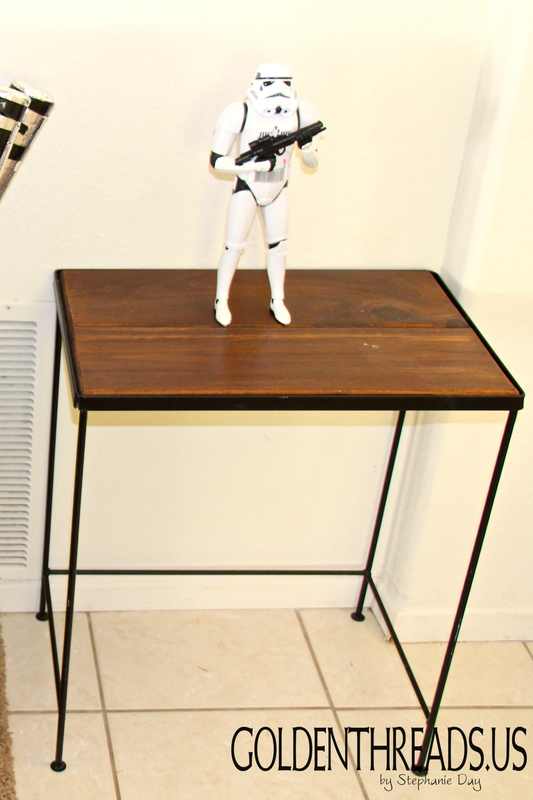 One of my favorites was using this 20+ year old Storm Trooper toy to “welcome” party guests. It either shot at you or calmly said, “move along” as you came through the front door. 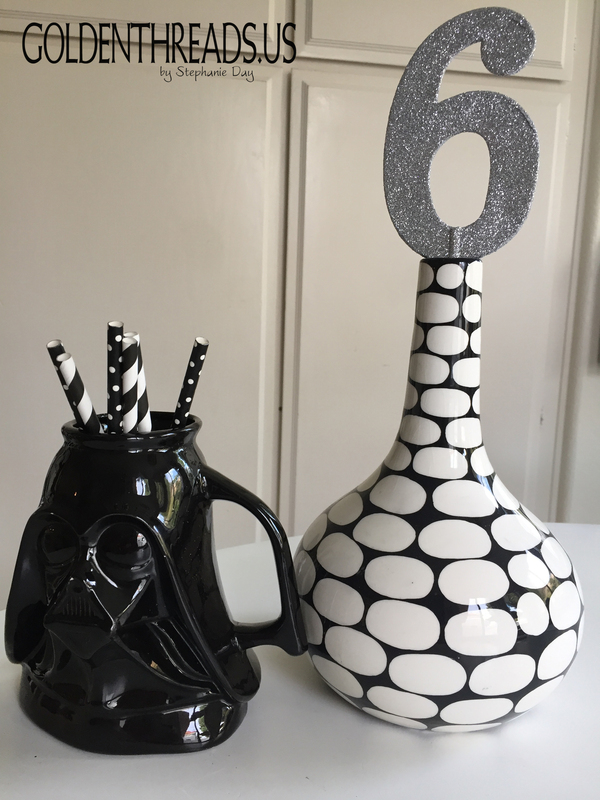 I ordered some balloons online and had them blown up at Party City, put straws in my husband’s old Darth Vader mug and bought a sparkly “6” from Michael’s and put it in a vase I already had. The food and activities were themed and decorative themselves, so we focused more on those. We had about 40 people in the house so we planned a few activities for the kids. There’s a fine balance between planning creative “stations” and just letting kids play. Too many pinterest ideas and it gets to be too much. Nothing but free play and you miss out on bringing everyone together for some themed, planned-ahead fun. We always gate off the upstairs to keep some part of the house from getting destroyed, as well as try and keep as much partying outside as possible. 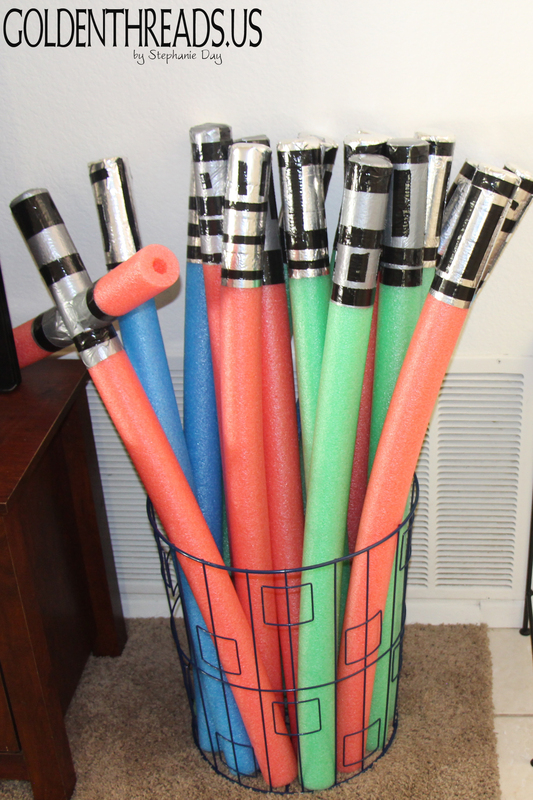 Since we (I mean my husband) made over 20 light sabers, we needed some rules (light sabers outside only) and a bit of structure. 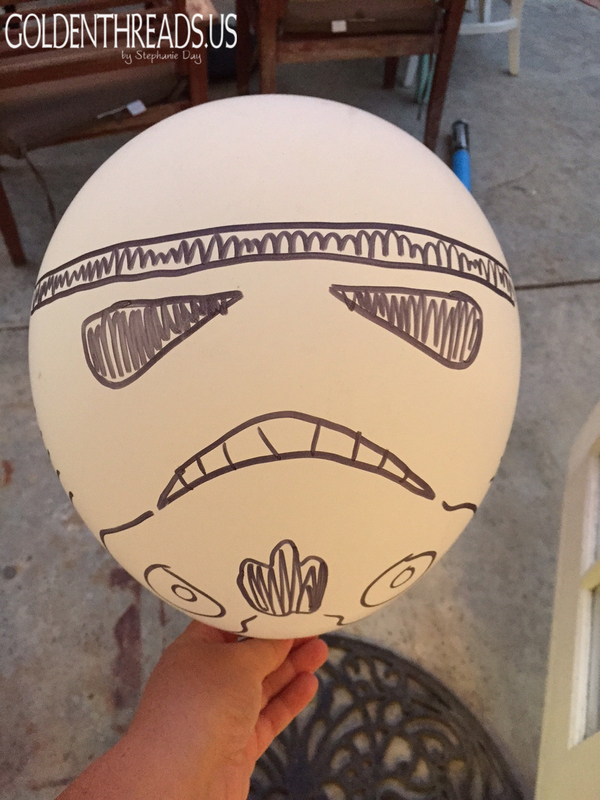 We made storm trooper balloons for them to hit, but that only kept their attention for about 5 minutes because really they just wanted to battle each other. Darth Vader came on the scene for one good epic battle and it was just what they needed. We also had a Princess Leia headband making station for some of the older girls. 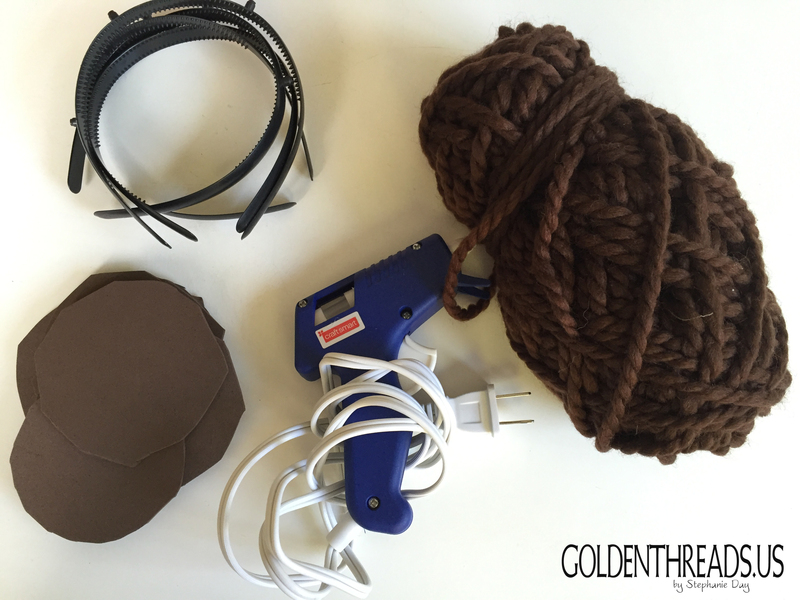 Brown foam sheets cut into circles, thick brown yarn, plastic headbands (ours were not real great) and a glue gun. This station really needed an adult helper and would have been great to have some already finished bands for the littler girls. It became pretty time consuming! Tutorial here. 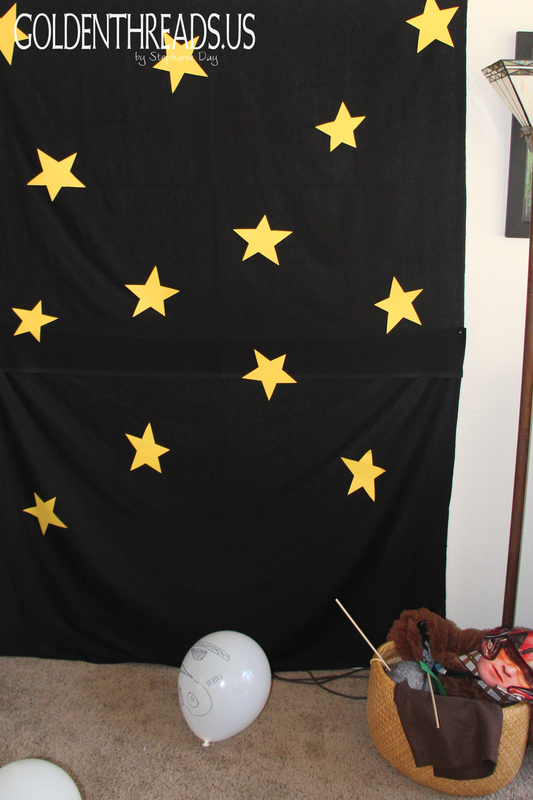 We also had a photo booth set up for kids to pose with Star Wars props. We found some cute templates online, grabbed a Jedi robe and a Chewbacca hoodie we already had and then picked up/made a few other props ourselves. If I had to do it again, I would have someone stationed there with a camera to get kids involved because the booth didn’t get as much traffic as I had hoped. I thought parents with phones would capture a bunch, but I think they were busy chatting and eating good food. 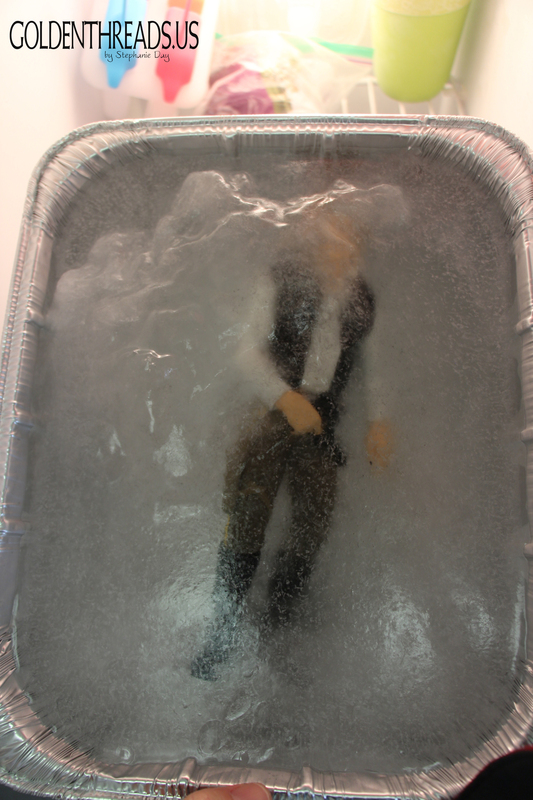 A really fun and easy activity was to free Han Solo from being frozen in carbonite. 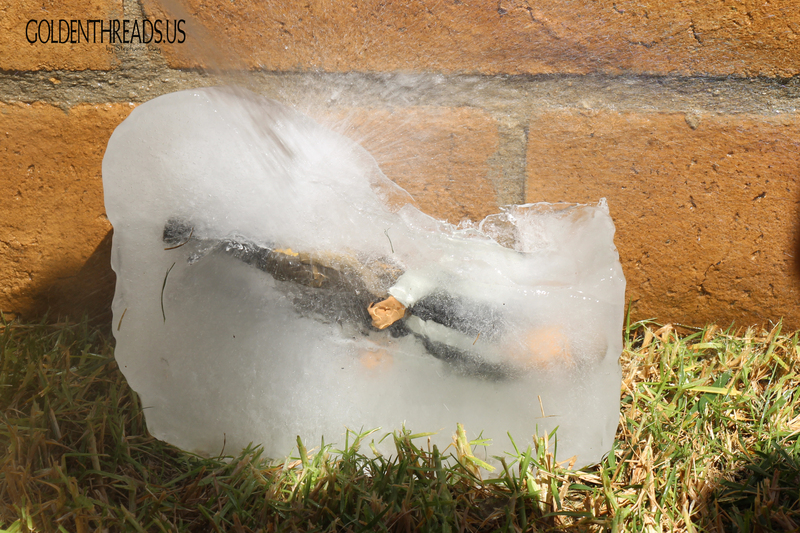 The kids were given the block of ice outside and had to come up with all sorts of ways to get him out. In the end, the garden hose on pretty high pressure was the most effective. The kids had a ton of fun with this one and it was so easy and inexpensive. 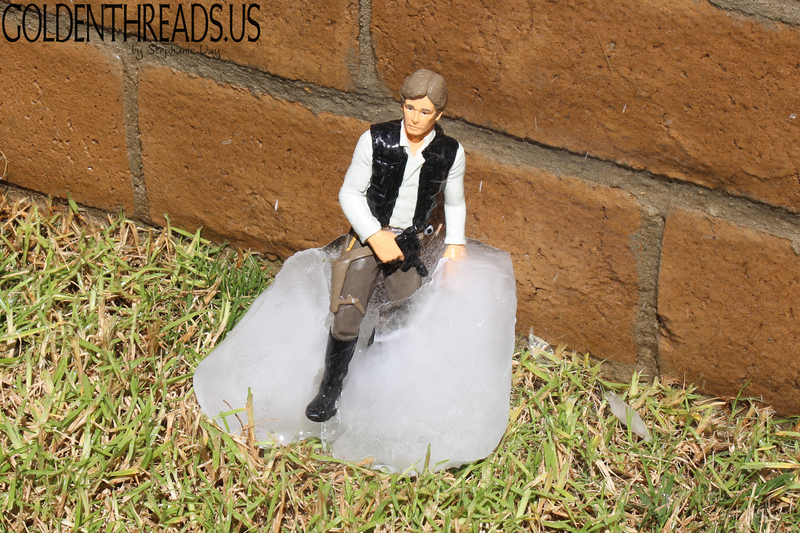 We already had Han and we bought a $2 foil pan to freeze him in. 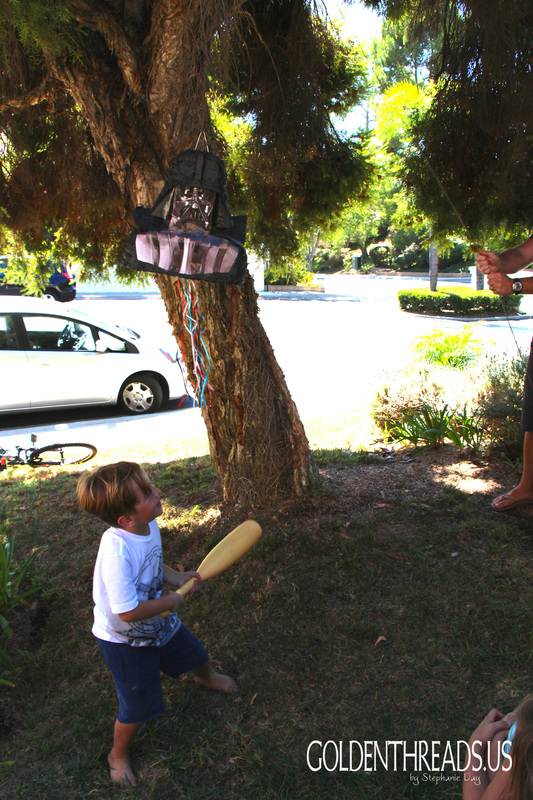 And then the piñata. I had dreams of making a Death Star piñata with a beach ball and paper mache, etc etc, etc, but not every fun idea makes the cut in the end. 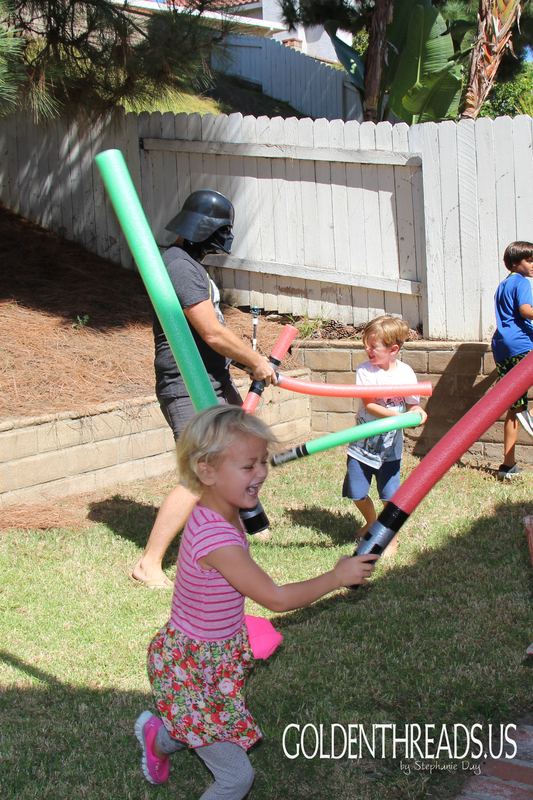 So we bought a Darth Vader one at Wal-Mart, filled it with stuff, tried to keep the kids from fighting in line and had just as much fun with a lot less work. We had our party over lunchtime so we put out ingredients for a panini bar. This is a great party meal because people essentially make their own hot meal when they’re ready to eat. The night before the party we grilled chicken breasts, roasted peppers, made a special mayonnaise and sliced up anything that would hold up well overnight. The day of the party we did some last minute slicing and then lined up all the ingredients on the bar with a hot panini press at the end. We just added chicken to this super yummy recipe here. Also to munch on was a veggie platter, big bowls of grapes, strawberries and good kettle cooked potato chips. 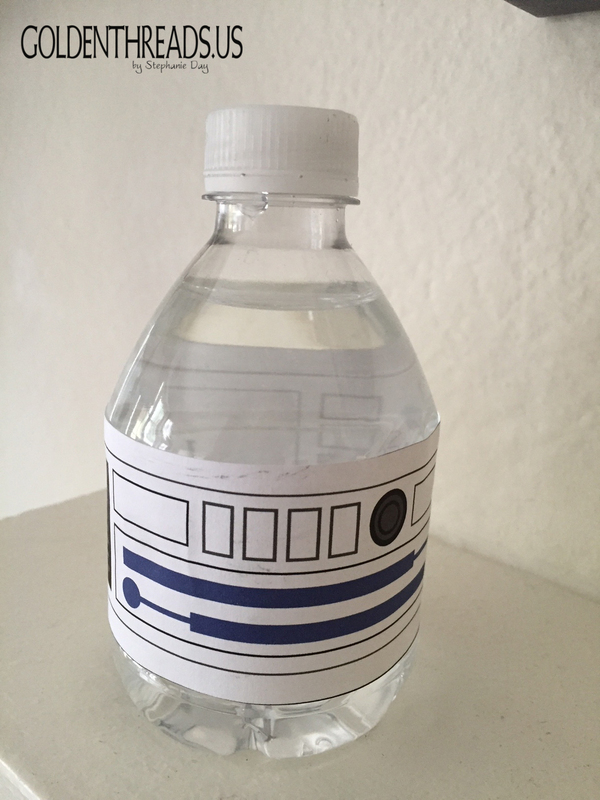 We had Yoda Soda in a jar dispenser (forgot to get a picture) and R2D2 water bottles, which my kids loved helping me make the week leading up to the party. Here is a template you can print and cut. We just removed the original label and affixed these on with double-sided tape. The sweet treats for this party were the biggest hit. 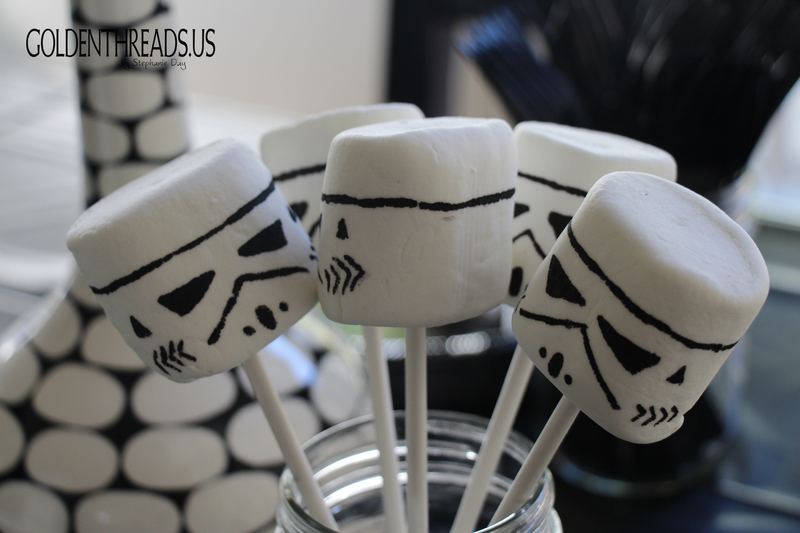 First our stormtrooper marshmallows, which I made by drawing stormtrooper faces on jumbo marshmallows with edible marker (get online or at Hobby Lobby) and putting them on lollipop sticks. I made them a couple days ahead and kept them fresh in a ziploc bag. I got the idea from here. 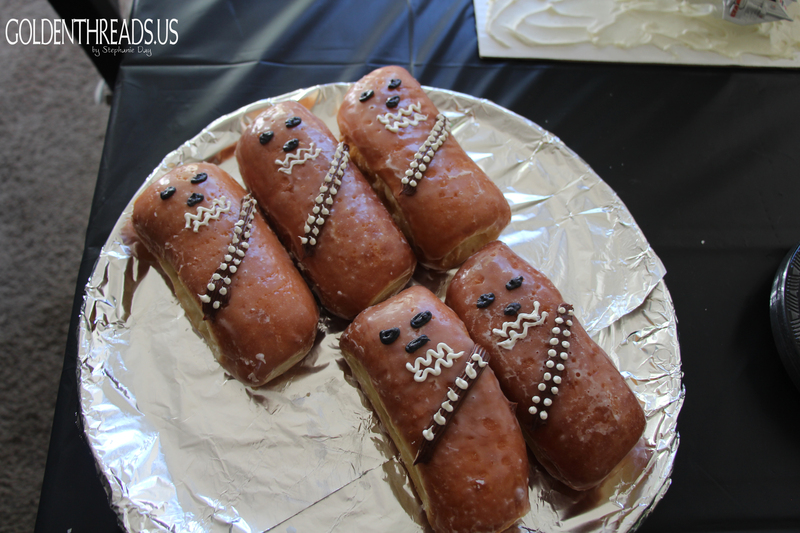 And then of course there were the incredibly yummy Chewbacca donuts. Unfrosted maple bars (lightly glazed) with Chewy’s features piped on with icing. We ordered them undecorated from a really good local bakery and picked them up the morning of the party. My sister and my niece quickly decorated them and they were eaten up almost too fast for us to get a picture! How-to instructions here. And to top off the sweets, my husband Brian and I made the craziest cake we’ve done yet. 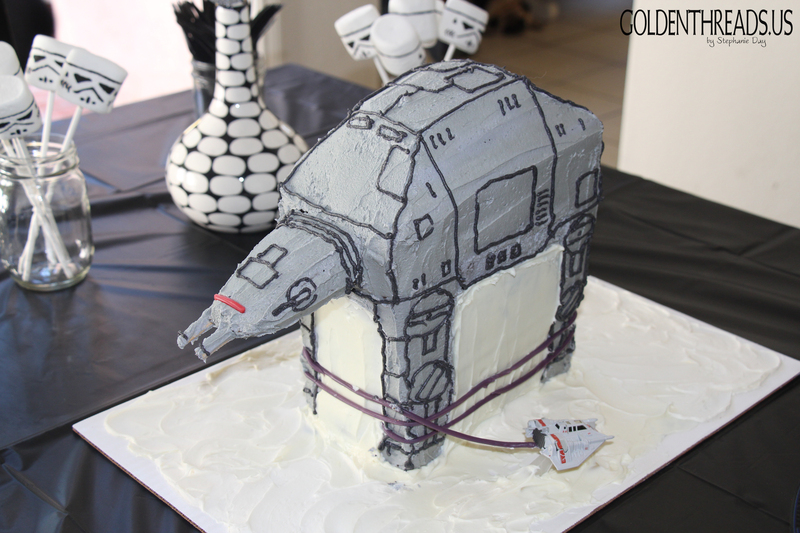 We asked Sawyer what shape of cake he wanted and he chose an AT-AT Walker. Yikes. But they’re his favorite and I suppose it’s our fault for asking! I made the cakes, Brian cut/ assembled/ secured the parts, I made icing and covered the guy and his snowy base and Brian did the detail. As we were brainstorming with Sawyer (he has a lot of big ideas) he said, “ya and it could have a snow speeder pulling it down with a tow cable wrapped around his legs!” He can thank his dad for making those ideas a reality. This party was a “bit” labor intensive and a LOT of fun. Can you see the tired in our faces?? ?